Groupon has finally provided irrefutable evidence of its impending arrival in Thailand with the launch of a website for the service in the country. Thai technology blog ThumbsUp spotted that the group buying giant’s website had gone live, though it is just an introduction to allow customers to register to receive confirmation when the service is launched. We speculated that a launch would be forthcoming in the early part of this year, and that looks to be the case with the quiet introduction of the website. The company had issues grabbing the logical groupon.co.th domain, which fell victim to cybersquatters, and has instead launch using Groupon.biz. The firm previously hired its executive team and pushed out ads for middle management, and its hiring efforts continue. An advertisement on the Thai Visa forum seeks a range of positions as the company “is looking to build our founding team and develop Groupon Thailand into a regional power”. The Thailand branch of the company is being headed up by president and managing director Trip Wagoner, who formerly ran Groupon’s Crazyzeal operations in India, with former Detsche Telecom consultant Damian Kemner installed as managing director and CEO. Positions are also taken by founders Surawat Promyotin (sales director) and Bela Gupta (COO), while we discovered head of national sales and strategic partnerships Jay Neesanant in November. What is unclear at this stage is whether Groupon is launching with a local partner, as is its common policy for moving into new markets. Thai Internet firm Sanook is the most logical partner given that it already runs a coupon service and has links with Tencent — Groupon’s partner in China — which owns 49 percent of the firm. A Sanook spokesperson was “unable to provide a response” when asked if the company was partnering with Groupon on the initiative. Groupon missed out on buying Thai market leader Ensogo, which was bought by LivingSocial. The company is keen on a move to Thailand as it has services in most of Southeast Asia’s other significant markets, including Malaysia, Singapore, Philippines (as Beeconomical) and Indonesia (under recently acquired Disdus). Groupon’s corporate team and Thai representatives are yet to respond to our request for comment, however we will update this article with any statement that we receive. 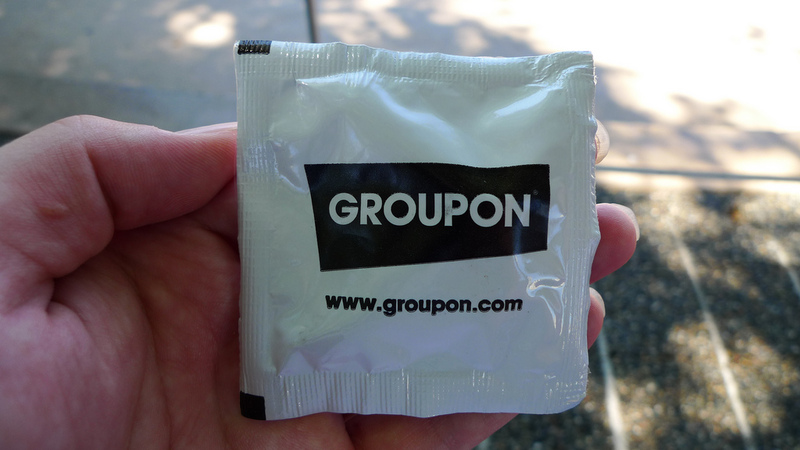 For those curious of the headline image, it isn’t a Groupon-branded condom and in fact contains skittles. Update: A Groupon spokesperson has been in touch to confirm that the company is currently unable to talk about its service in Thailand. We suspect that a launch event will be coming soon.